November 2017, December 2017, January 2018 - $1000 off charters 7+ nights. (does not apply to holidays: Thanksgiving, Christmas, New Year's) and CAN be used with other discounts. Resort Course is $150.00 and would need an instructor on board. 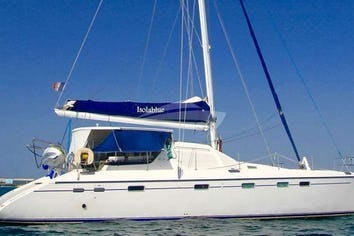 Full Course is $300.00 and would need an instructor on board. Captain Connor is a Divemaster. Extra dives are $25.00 per person/per dive. Connor Dugan and Taylor Esposito bring a strong sailing background, adventurous spirits and professional service background to the Virgin Islands charter industry. Connor was born and raised in a small shore town in New Jersey, racing Optis, Lasers and 420s at a young age. His love of sailing progressed into his high-school years; he and his family moved to Wilmington, North Carolina, where he worked summers teaching youth sailing. After a summer spent living aboard a 50' catamaran in the Grenadines, Connor knew that sailing would be a part of his life forever. His passion for sailing continued high-school and into college, he spent his summers on Bald Head Island, NC, teaching sailing aboard J80s on the challenging waters of the Cape Fear River. 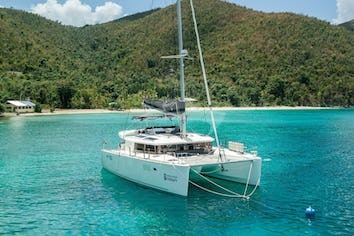 Soon after graduating from UNC Charlotte, Cnonor decided to move to the US Virgin Islands to pursue a career as a licensed captain, running day charter catamarans out of the Westin and the Ritz-Carlton, before joining Great Adventure. Taylor was born and raised in Upstate New York. Growing up, she spent summers on the rivers among the 1000 Islands, Old Forge Lake in the Adirondacks, and on the beaches of North Carolina. After high school, she chose a route of independence: she moved to Hawaii, learned how to surf and fell in love with the island life. Living for four years on Maui, she developed a passion for a more natural lifestyle. Her time abroad in Thailand, Indonesia, and Central and South America taught Taylor about different flavors and ingredients, which continue to inspire her cooking. Her culinary instincts are illustrated in her creative style, using healthy, colorful ingredients that taste amazing and leave her guests feeling great. 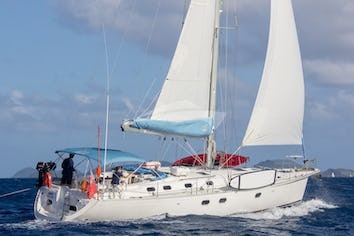 Taylor's love for sailing has reached new heights in the Virgin Islands; working as crew aboard day charter sailing catamarans, teaching sailing aboard Hobie 16s in the St. John National park, and spending time on the water with Connor has shaped Taylor into a well seasoned sailor. Connor and Taylor combine their love for sailing and being on the water with a strong sense of adventure and attention to detail. They have amassed a wealth of worldly knowledge and skills that they use to create unforgettable vacation experiences that will leave their guests with new perspectives and life-long memories. I just had to write to let you know how impressed our family was with the Great Adventure crew. As you may have heard, we had some difficulties early on when I couldn't find our passports. Connor was on the phone, I was crying, everyone was looking. They were light on their feet and adapted quickly with a new plan and enthusiasm about how great vacation would still be. When I found them early the next morning, it was game one. Back to the first plan and they managed to make everything happen that we hoped for. Connor and Taylor are hospitable, accommodating, and knowledgeable beyond their young age. Our sons related well to them and enjoyed learning from both of them about local history, fishing, boating, and even cooking. Their boat was clean, well kept, and provisioned perfectly for us. We would highly recommend them to anyone in the future.